A multimodality imaging approach is often required for imaging of the biliary tract. 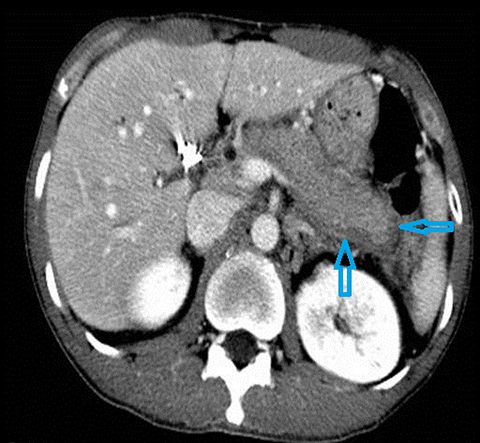 The evaluation of adults presenting with biliary disease depends to a large extent on clinical symptoms of pain, presence and duration of jaundice, prior history of gallstones and any associated symptoms such as fever or weight loss.1, 2 Ultrasound, computed tomography (CT), magnetic resonance cholangiopancreatography (MRCP) and ERCP all have a role in the diagnosis of biliary pathologies. 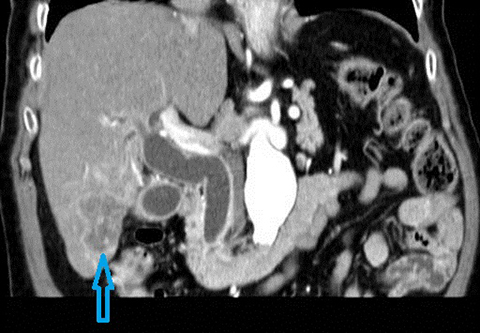 The objective of this article is to review the indications for use of ultrasound, CT, MRCP and ERCP in biliary tract disease. 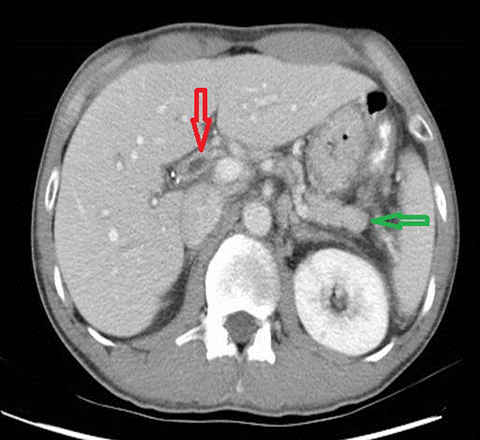 The imaging features of common and uncommon infectious, inflammatory and neoplastic processes affecting the biliary tree, as well as the radiological management options, will be discussed. 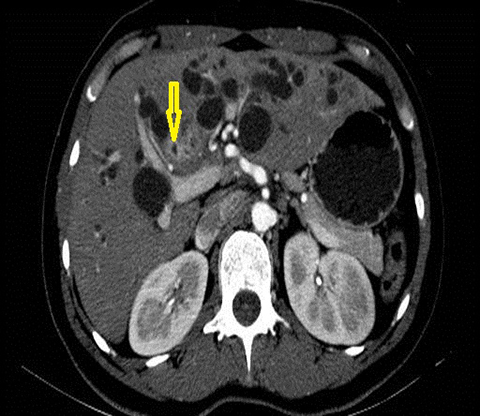 The most commonly encountered infection of the biliary tract is acute pyogenic cholangitis. Less common infections such as acute suppurative cholangitis, recurrent pyogenic cholangitis, infestation with parasitic organisms and biliary tract infections affecting immunocompromised individuals may have similar presenting features, but they tend to occur in specific patient groups. 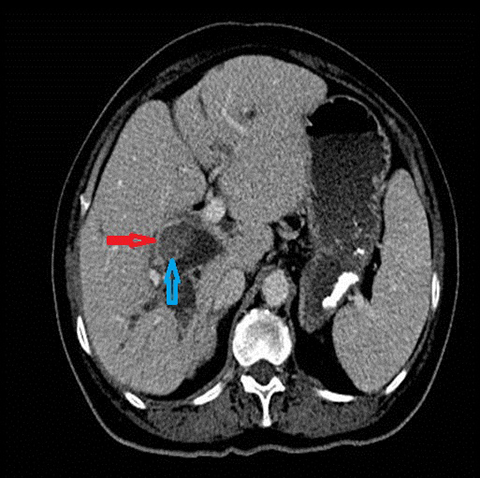 In acute cholangitis, the imaging findings include both biliary and parenchymal changes. Biliary changes include dilatation of the common bile duct in the setting of obstruction with dilatation of intrahepatic biliary ducts which can involve the central or segmental bile ducts only or diffusely involve the whole biliary tree (Figure 1). 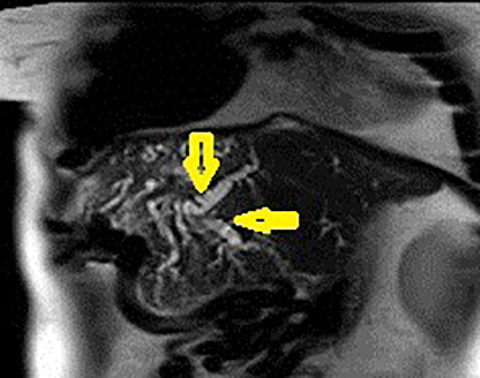 In 85% of cases, this is associated with smooth and symmetric extrahepatic bile duct wall thickening but less commonly, is associated with enhancement of the intrahepatic biliary duct walls (a finding best seen on delayed phase gadolinium-enhanced fat-saturation T1-weighted 3D gradient echo sequences). The parenchymal changes include increased T2 signal intensity (occurs in approximately 70% of cases) in a wedge-shaped or peri-biliary distribution (Figure 2). Hepatic parenchymal enhancement may be detected in the arterial phase only in approximately 60% of cases, in the delayed phase in approximately 15% of cases, or in both the arterial and delayed phases in approximately 36% of cases. 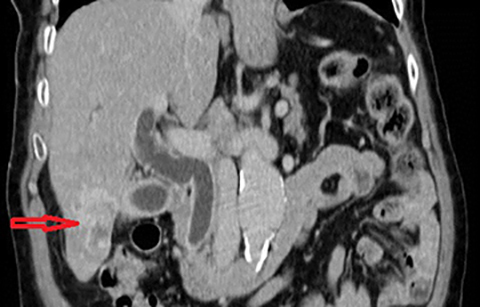 The pattern of enhancement may be wedge-shaped, peripheral patchy, or peribiliary.4,5 Cross-sectional imaging is also useful for identifying the underlying cause for cholangitis (stone, stricture or neoplasm). 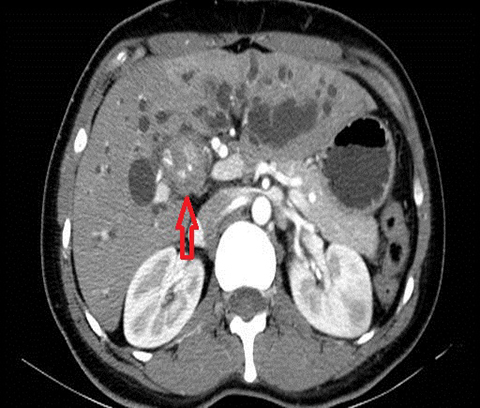 Acute suppurative cholangitis is a life-threatening condition characterized by the presence of pus in the biliary tree occurring in up to 60% of cases of acute cholangitis. Emergency endoscopic or percutaneous biliary drainage is necessary for decompression. Primary sclerosing cholangitis (PSC) is an idiopathic chronic cholestatic disease, which is presumed to be autoimmune in nature. It is characterized by diffuse cholangitis and progressive fibrosis of the biliary tree. PSC typically manifests in the 4th or 5th decade, with a male preponderance. There is a strong association with inflammatory bowel disease (60-80%), especially ulcerative colitis.17 One of the most concerning complications of PSC is cholangiocarcinoma which develops in up to 10% of patients, with an annual incidence of 0.6 - 1.5% per year. PSC patients develop cholangiocarcinoma two to three decades earlier than patients without risk factors. 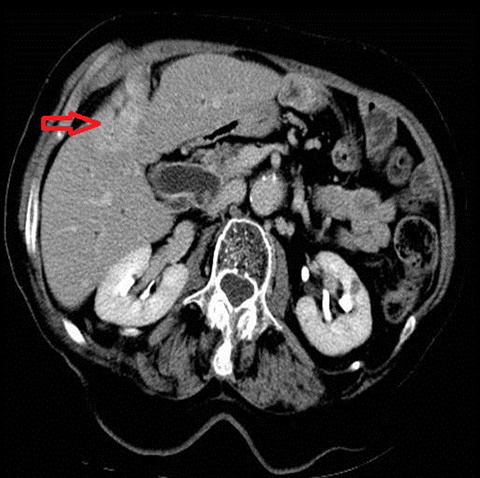 Despite this increased incidence, there are currently no evidence-based guidelines for screening for cholangiocarcinoma in patients with PSC, however, MRCP and measurement of CA 19-9 levels at annual intervals should be considered. Biliary intraductal papillary mucinous neoplasm has a number of synonyms including biliary intraductal papillary mucinous tumor, mucin-producing cholangiocarcinoma, mucinous ductal ectasia of biliary tree and mucin-hypersecreting carcinoma. A wide range of pathologic entities affects the biliary tract, with cholangitis due to choledocholithiasis being the most common. However, other etiologies, including less common infectious processes, inflammatory conditions and neoplasia, should also be considered. A multimodality and multidisciplinary approach is often required for definitive diagnosis of biliary disorders and appropriate management. American College of Radiology Appropriateness Criteria ® on imaging of jaundice. http://www.acr.org/Quality-Safety/Appropriateness-Criteria. Yeh BM, Liu PS, Soto JA, et al. 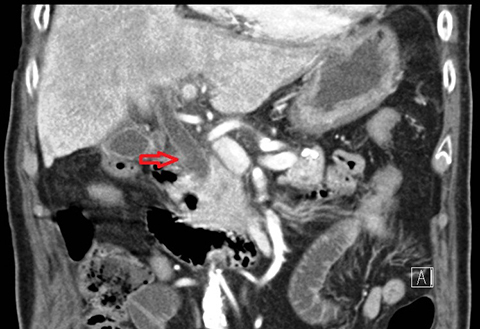 MR imaging and CT of the biliary tract. RadioGraphics. 2009; 29(6):1669-1688. Heller MT, Borhani AA, Furlan A, et al. 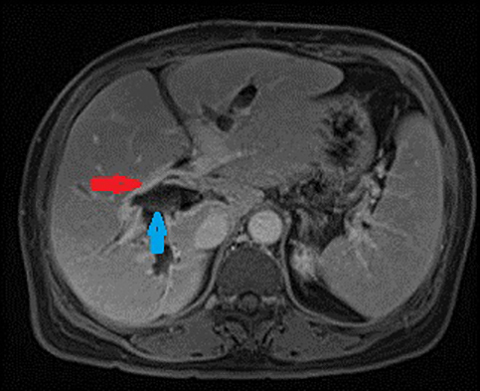 Biliary strictures and masses: an expanded differential diagnosis. Abdom Imaging. 2014 Epub ahead of print. O’Conner O, O’Neill S, Maher MM. Imaging of biliary tract disease. AJR Am J Roentgenol. 2011; 197(4):W551-W558. Håkansson K, Ekberg O, Håkansson HO, et al. MR characteristics of acute cholangitis. Acta Radiol. 2002;43(2):175-179. Watanabe Y, Nagayama M, Okumura A, et al. 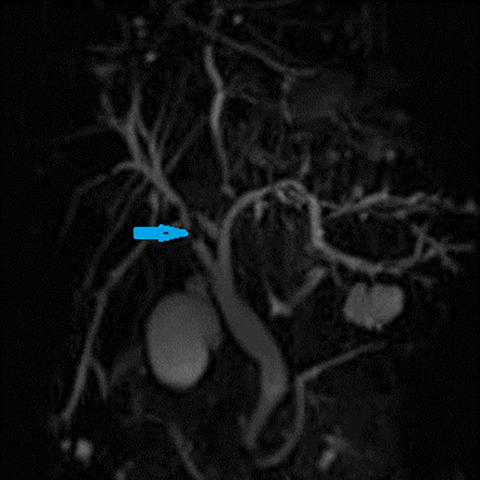 MR imaging of acute biliary disorders. RadioGraphics. 2007;27(2): 477–495. Lo CM, Fan ST,Wong J. The changing epidemiology of recurrent pyogenic cholangitis. Hong Kong Med J. 1997; 3(3):302-304. Nakayama F, Soloway RD, Nakama T, et al. Hepatolithiasis in East Asia: retrospective study. Dig Dis Sci. 1986;31(1):21-26. Kim MJ, Cha SW, Mitchell DG, et al. 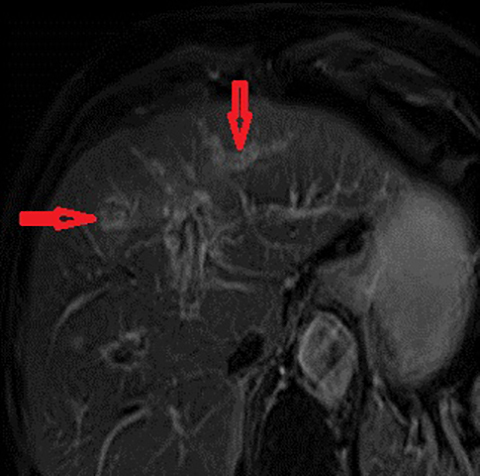 MR imaging findings in recurrent pyogenic cholangitis. AJR Am J Roentgenol. 1999;173(6):1545–1549. Park MS, Yu JS, Kim KW, et al. 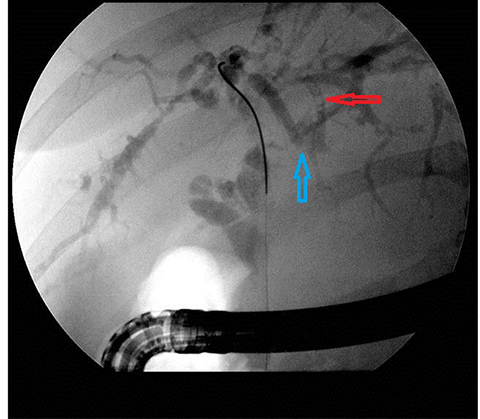 Recurrent pyogenic cholangitis: comparison between MR cholangiography and direct cholangiography. Radiology. 2001;220(3):677-682. Dusak A, Onur MR, Cicek M, et al. Radiological imaging features of fasciola hepatica infection – a pictorial review. J Clin Imaging Sci. 2012; 2(1):1-8. Manzella A, Ohtomo K, Monzawa S, et al. Schistosomiasis of the liver. Abdom Imaging. 2008;33(2):144–150. Chou Y, Chiou H, Tiu C, et al. 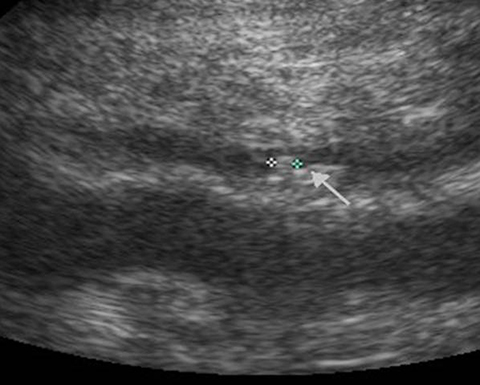 Duplex doppler ultrasound of hepatic schistosomiasis japonica: a study of 47 patients. Am J Trop Med Hyg. 2003; 68(1):18-23. Tonolini M, Bianco R. HIV-related/AIDS cholangiopathy: pictorial review with emphasis on MRCP findings and differential diagnosis. Clin Imaging. 2013;37(2):219-226. Chapman R, Fevery J, Kalloo A, et al. Diagnosis and management of primary sclerosing cholangitis. AASLD Practice Guidelines. Hepatology. 2010; 51(2): 660-678. Menias CO, Surabhi VR, Prasad S, et al. Mimics of cholangiocarcinoma: spectrum of disease. RadioGraphics. 2009; 28(4): 1115-1129. Bodily KD, Takahashi N, Fletcher J, et al. 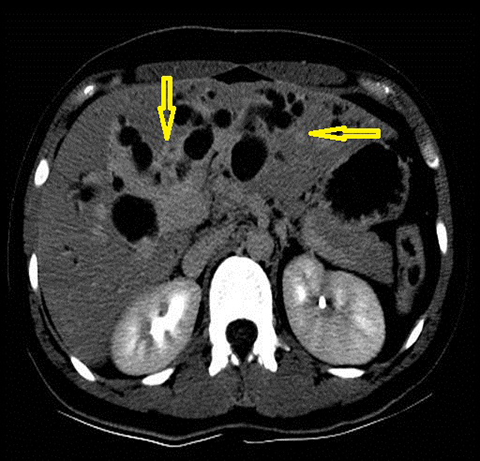 Autoimmune pancreatitis: pancreatic and extrapancreatic imaging findings. AJR Am J Roentgenol. 2009; 192(2): 431-437. Eerens I, Vanbeckevoort D, Vansteenbergen W, et al. 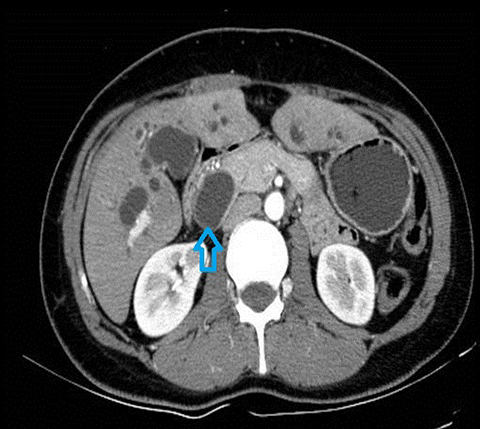 Autoimmune pancreatitis associated with primary sclerosing cholangitis: MR imaging findings. Eur Radiol. 2001;11(8):1401-1404. Leise MD, Smyrk TC, Takahashi N, et al. 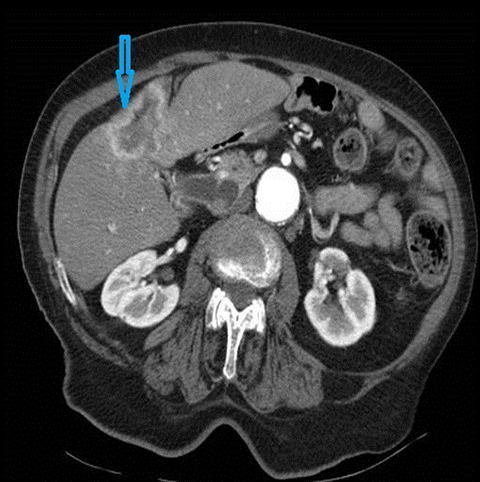 IgG4-associated cholecystitis: another clue in the diagnosis of autoimmune pancreatitis. Dig Dis Sci. 2011;56(5):1290-1294. Razumilava N, Gores GJ. Classification, diagnosis, and management of cholangiocarcinoma. Clin Gastroenterol Hepatol. 2013; 11(1):13–21. Engelbrecht MR, Katz SS, van Gulik TM, et al. 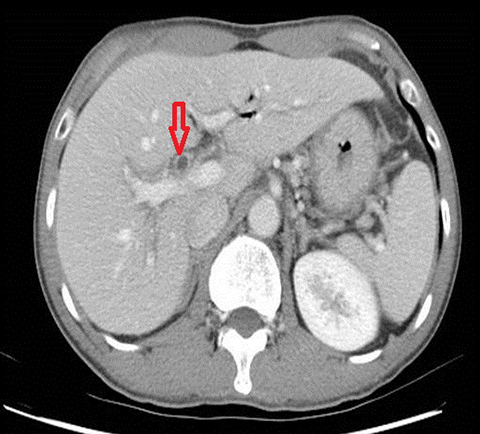 Imaging of perihilar cholangiocarcinoma. AJR Am J Roentgenol. 2015; 204(4):782-791. Hennedige TP, Neo WT, Venkatesh SK. Imaging of malignancies of the biliary tract—an update. Cancer Imaging. 2014;22;14(1):14. Khan SA, Davidson BR, Goldin RD, et al. Guidelines for the diagnosis and treatment of cholangiocarcinoma: an update. Gut. 2012;61(12):1657-1669. Wilson SR, Burns PN. Microbubble-enhanced US in body imaging: What role? Radiology. 2010;257(1):24-39. Lim JH, Yoon KH, Kim SH, et al. Intraductal papillary mucinous tumor of the bile ducts. RadioGraphics. 2004; 24(1):53-67. Walshe TM, McLean KA, Patel R, Chang SD, Harris AC. Imaging of the biliary tree: Infection, inflammation and infiltration. Appl Radiol. 2016;45(4):20-26. Dr. Walshe, Dr. McLean, Dr. Patel, Dr. Chang, and Dr. Harris are all with the Department of Radiology, Abdominal Division, Vancouver General Hospital, Vancouver, British Columbia, Canada. A portion of the material included in this article has been presented as a categorical course at ARRS 2014 and as an education exhibit at RSNA 2013.